Everywhere we go people comment about our fantastic PA systems. 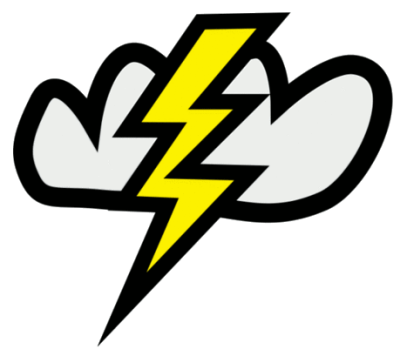 First they are completely portable and work on AC or DC. Small enough to handle easily. Yet loud enough for up to 300 people to hear you clearly. 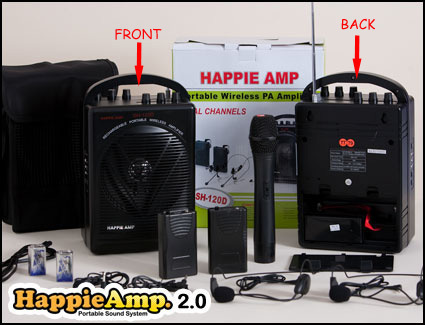 Happie Amp features a full line of accessories for all their amps. Allowing you to customize your system the way you want it. With two styles to choose from you won't go wrong. These can be used from small parties all the way to school assemblies and PTA meetings. Featuring three styles of microphones and 2 frequencies. So if you are a duo you can both speak at the same time. Now use two amps together and have speakers on both sides of your stage. All wireless and working in tandem. Control all your sound with the new Ultimate Control. Bluetooth and key fob control. 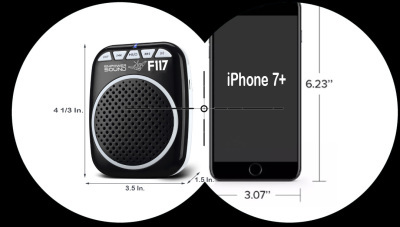 The new F117 is a mini amp with loads of power. All wireless just turn it on and put on your headset. It also allows you to add a mp3 player to add music to your show. This is pocket sized yet will supply sound for up to 40 to 50 poeople. In a classroom or library setting it will even do more. Great unit that runs on a lithium battery so you just plug it in and charge the unit and the head set. If you want something that will enhance your voice this is it.